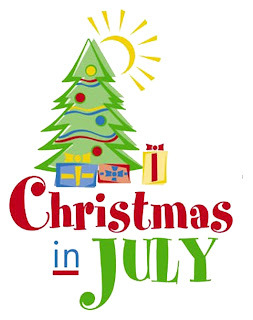 There seems to be a trend of celebrations in July being named "Christmas in July". So, I thought this would be a fun theme for a date night, too! Crank the AC (to make for a chilly, winter night), get into some pajamas, and welcome your spouse home with "Merry Christmas!" After you get a funny look from them, point to the fake mistletoe (a picture of it will do) above you. When he/she is all setted, accompany them back to your room which is decked out in holiday decor (well, enough to get the idea, anyway). Have some holiday music playing and have him/her open a little gift you got for them or maybe their stocking with some fun and simple stocking-stuffer type items. Make a treat that is normally reserved only for the holidays for you both to enjoy while you watch your favorite holiday movie. C'mon...this one is totally do-able and fun. AND, it would be totally unexpected! Hey this one made me giggle. This is another fabulous idea! I love this one! I can do it now even on bedrest (with a little help of course). Thanks! so cute, hopefully I can try it soon! I love your blog! Such creative ideas. Thanks for sharing. Hope you don't mind if I stop by more often! so cute, love the idea! cher- you're a genius!